Genomic selection is an approach that uses whole-genome marker data to predict breeding values of genotypes and holds the potential to improve the genetic gain in breeding programs. 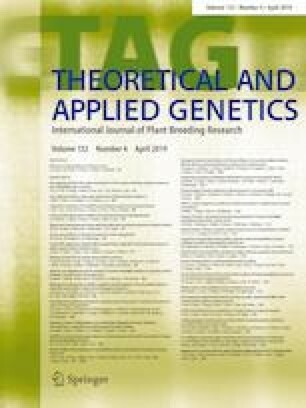 In this study, two winter wheat populations (DS1 and DS2) consisting of 438 and 585 lines derived from six and eight bi-parental families, respectively, were genotyped with genome-wide single nucleotide polymorphism markers and phenotyped for Fusarium head blight and Septoria tritici blotch severity, plant height and heading date. We used ridge regression-best linear unbiased prediction to investigate the potential of genomic selection under different selection scenarios: prediction across each winter wheat population, within- and among-family prediction in each population, and prediction from DS1 to DS2 and vice versa. Moreover, we compared a full random model to a model incorporating quantitative trait loci (QTL) as fixed effects. The prediction accuracies obtained by cross-validation within populations were moderate to high for all traits. Accuracies for individual families were in general lower and varied with population size and genetic architecture of the trait. In the among-family prediction scenario, highest accuracies were achieved by predicting from one half-sib family to another, while accuracies were lowest between unrelated families. Our results further demonstrate that the prediction accuracy can be considerably increased by a fixed effect model approach when major QTL are present. Taken together, the implementation of genomic selection for Fusarium head blight and Septoria tritici blotch resistance seems to be promising, but the composition of the training population is of utmost importance. The online version of this article ( https://doi.org/10.1007/s00122-018-3264-6) contains supplementary material, which is available to authorized users. We highly appreciate the excellent technical support of the teams at KWS LOCHOW and University of Hohenheim. This research was funded by the German Federal Ministry of Education and Research (BMBF, Grant No. 031B0011A+E) in the framework of Bioeconomy International (FusResist). The responsibility of the content of this publication rests with the authors. The experiments comply with the current laws of Germany in which they were performed.